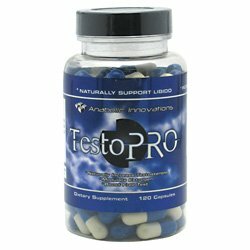 Anabolic Innovations TestoPro On Sale! » Boost Free Test. Increase Strength. » Increase Lean Mass. TestoPRO Complex (Proprietary Blend): Quercetin 95%, Divanil [95% 3,4-Divanillyyltetrahydrofuran From Urtica Dioica], Indole-3-Carbinol (I3C). Take 2 capsules in the AM and anther 2 capsules in the PM.